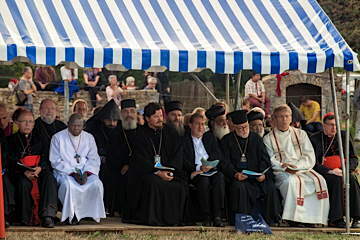 On August 16, 2015, many Church leaders and representatives of other religions were present at Taizé. Here is the list. World Evangelical Alliance: Associate Secretary General, Wilf Gasser (who also represented the European Evangelical Alliance), Secretary for Ecumenical Questions, John Baxter-Brown, Rosalee Veloso Ewell. Czech Council of Churches: President, Rev. Daniel Fajfr. Hungarian Council of Churches: Secretary General, Rev. Vilmos Fischl. 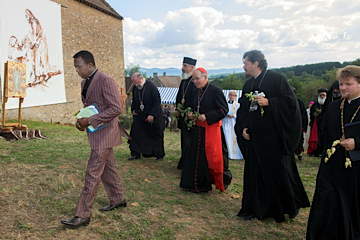 Ecumenical Institute of Bossey : Director, Rev. Ion Sauca. Most Rev. Jacques Blaquart, Bishop of Orleans, France. Most Rev. Pierre Dumas, Bishop of Anse-à-Veau and Miragoâne, Haiti. Most Rev. Olivier de Berranger, Bishop Emeritus of St Denis, France. Most Rev. Gérard Daucourt, Bishop Emeritus of Nanterre, France. Most Rev. Peter Rosazza, Bishop Emeritus of Hartford, USA. Malankar Syrian Orthodox Church: Metropolitan Geevarghese Mar Coorilos, Mumbai, India, Fr. Aswin Fernandis, Ms. Elizabeth. Sister Pierrette, Prior of the Community of Grandchamp. United Protestant Church of the Netherlands: the Secretary General, pastor Arjan Plaisier. World Baptist Alliance: Secretary General, Rev. Neville Callam, USA, Dr. Jim Johnson. Rev. Shokei Steffens, Rev. Shohaku Kodoi, Mr. Jochen Nölle, Mr. Akihiro Fukutani, delegation of Nichiren-So, Japan and Germany.